On of the most common parts that gets swapped out for a repro is the switch tip. It’s a $200 part these days and the repros have gotten pretty good. If it’s an amber one, look for a seam. If there is one, it ain’t the real deal. If there isn’t a seam, it could still be a repro. If it’s a white one, it should have a seam and usually a crack. I have a pet peeve about the vintage guitar business and, frankly, it drives me a little nuts. Let me set the stage and give my peeve some context. Guitars get modified over decades. Parts get changed, finishes get touched up and redone, stuff wears out and so on. I get that. And I don’t expect individual sellers to know everything about the guitar they are selling. As a dealer, it’s my job to know what to look for and to make a fair assessment of the guitar I’m buying. Part of the reason my inventory is fairly narrow is because I don’t generally buy what I don’t know about. I learned that by getting burned on a few guitars that turned out to be something other than they were touted to be by the seller. Many sellers will make good on an undisclosed issue but many can’t be expected to do so (widows and children of the original owner, for example). But undisclosed issues from individual sellers isn’t the pet peeve. It’s the undisclosed issues from the dealers. I should clarify. There are dealers and there are dealers. Most full time dealers are pretty good at accurately describing the guitars they sell and they have fair policies about returns-to a point. Many smaller dealers are just as good as the big boys. But there’s the scenario that drives me batshit. Player A buys an expensive vintage guitar from well regarded Dealer B. Player A gets 48 hours to accept or reject the guitar. He accepts the guitar because it’s a great player and everything looks right to his untrained eye and he is happy. Unbeknownst to player A, the neck PAF was rewound and the back was oversprayed. A year later, Player A trades the guitar (sight unseen) to me for a more expensive vintage guitar. “I know it’s correct because I bought it from Dealer B who has a great reputation.” That may be true but Dealer B never checked the pickups closely and didn’t notice the overspray-it sure looked right. And the 48 hour approval has long since run out. Then I get the guitar in hand and I have to deliver the bad news that the guitar isn’t what it was touted to be. This has happened dozens of times now (and I’ve only been doing this full time for 8 years) and it’s pretty distressing to the seller and to me, especially when the dealer has been in business for decades. Sometimes, it’s a $200 switch tip (really common), sometimes it’s undisclosed touchups. More often, its rewound pickups and changed parts. It’s often really hard to tell a repro tailpiece or bridge from a photo. Overspray is common and also very hard to see in a photo-even a blacklight photo if the overspray is old enough. The worst case (and it came from a well established dealer) was a 56 Stratocaster that had a repro body and an very well disguised All Parts neck. The dealer refuses to make good on it even though we (me and the previous owner) can prove the body and neck are the same ones that the dealer sold. I’m not mentioning names…yet. That’s thousands of dollars down the toilet. I’m not calling out specific dealers, I’m calling out all dealers including myself. It is your responsibility to know what you are selling and to go through it completely. 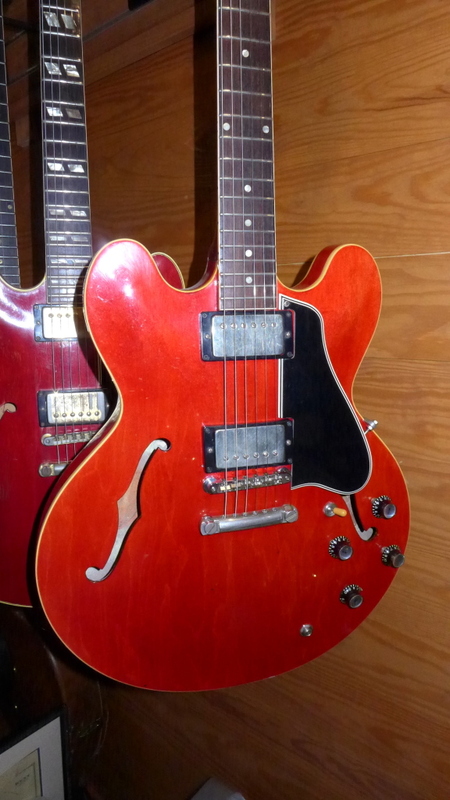 A couple of years ago, I sold a mint 62 ES-335 to a gentleman in California who really knew his stuff. I went through it pretty thoroughly but I never removed the thumbwheels under the bridge. It turned out that the bridge had been moved back slightly leaving two small holes, not visible unless you remove the thumbwheels. The guitar came back and I learned an important lesson. Look at everything on every guitar you get. Fix it or disclose it. Is it too much of a pain to check the pots on a 335? Then don’t sell 335’s or disclose that you never checked them. If the pickups have been opened and re-sealed, then disclose it. That should tell the buyer that they may have been rewound. Want a better solution? Open them back up and check the windings. It’s time consuming and a lot of work but it’s your responsibility to know exactly what you’re selling. Look at the solder. You can usually tell if the pickups have been opened. 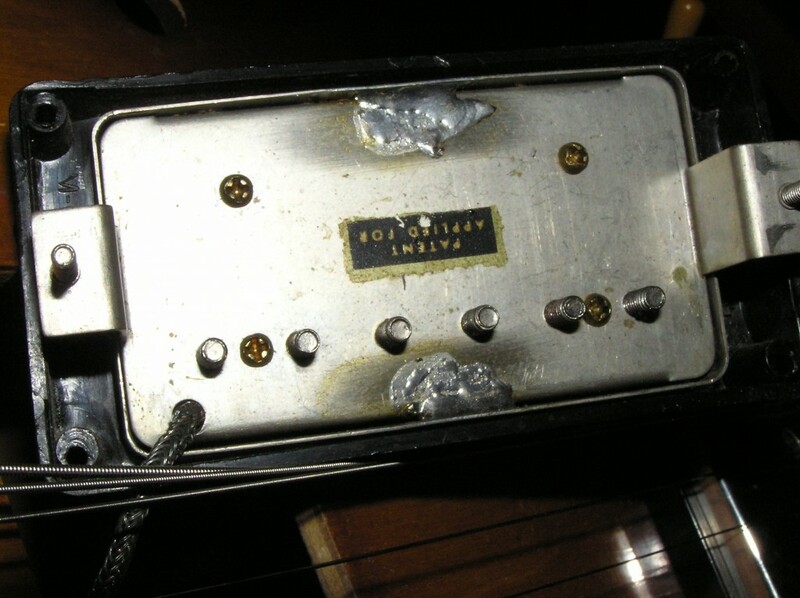 If they have been, and have been re-soldered, open them up again and check for a rewound pickup. Sometimes it’s not so easy to tell. Mostly, it is. Look for bent edges, flux around the solder or sloppy work. I’m sure this one was opened. Me and my Dad circa 1958. No guitars yet but they were coming. Nice shirt. I’ve been a guitar player since I was 11 years old and I probably don’t give my father enough credit for moving my guitar playing “career” along in the early days. 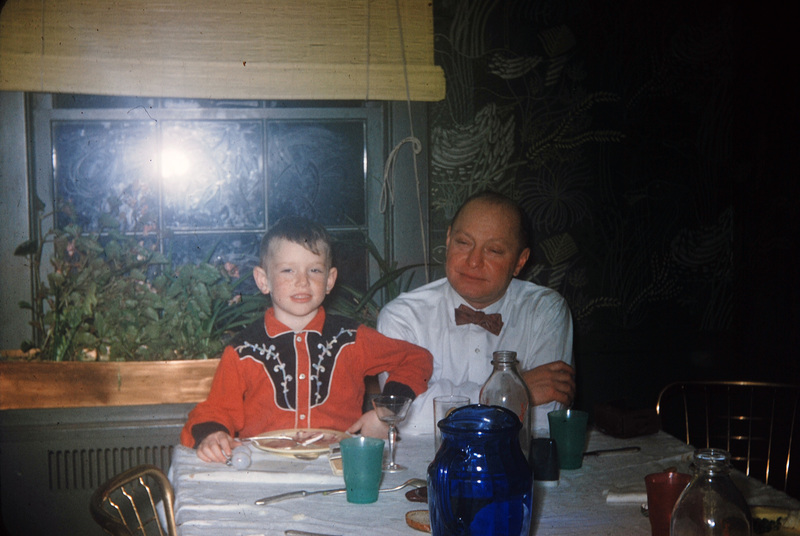 My father was monumentally unmusical. Couldn’t carry a tune, couldn’t play an instrument but he appreciated music and listened to it frequently. There was always something playing on the “hi-fi” in the living room. It was usually either classical (Beethoven was a big favorite) or show tunes. My father loved “South Pacific” probably because it echoed his WWII experience on Christmas Island in the middle of the, you guessed it, South Pacific. So, I got to have “There is Nothin’ Like a Dame” running through my head when I barely knew what a “dame” actually was. But rock and roll was not allowed on the big stereo in the living room. You want to hear “that awful music,” play it upstairs in your bedroom (on the crappy little portable 45 player). A 45, for anyone under 50, is a record that contained two songs, one on each side – yes, you had to physically flip over to play the “B” side. They were also called “singles” and they cost around a buck which was a lot of money to an 11 year old in 1964. So, I found a guitar teacher in Schenectady. His name was Charlie Orsini and he, like my Dad, hated rock and roll. He was a jazz guy and was happy to teach me the stuff he liked but not the stuff I wanted to learn. Fortunately, I learned a lot of useful chords and a little theory but the pentatonic scale never came into the picture. The lessons lasted less than a year but I kept on playing. Dad eventually (in early ’65) took me to the notorious Hermies Music Store in Schenectady where retail was a vague, nebulous concept. Retail plus 10% was more like it. I tried out a ’65 Fender DuoSonic and Princeton amp and my father sprung for the $159. “I’ll set it up and send it to the house,” Hermie said. When it arrived, it wasn’t the same guitar I played. It was a left over ’64 (three way rather than slide switches). He tried to upsell my father with the Princeton Reverb but Dad was having none of it. “Twenty bucks for one extra knob? Are they nuts?” So, the non-reverb unit would have to do. Also the phrase, “turn that *$@$%!! thing down” entered the family lexicon. Less than a year later, my little brother, Brian, two years younger, decided he would play the guitar and he would get the hand-me-down DuoSonic and I would get a new one. By this time, I was playing in a band pretty regularly, making pocket change -$25 for four of us was pretty standard for a 3 or 4 hour gig. We only knew about 20 songs, so repeats filled the last hour or so. I had learned that Hermies was jacking up the prices on Fenders and that a Stratocaster could be gotten in New York City for around $200 – Hermie wanted $410. New York was three hours away but Dad loaded me into the car and made the trip to Manny’s on 48th St. to buy my next guitar. I wanted either an Epiphone Crestwood (I still love those guitars) or a Stratocaster. Strangely, the only Crestwood they had was Inverness Green and I wasn’t about to play a green guitar. I wanted a sunburst. Even more oddly, there were no sunburst Strats available either. There was a white one (the DuoSonic was white and I was sick of it) and a Sonic Blue. A baby blue guitar? Are you kidding? So, I got my father to spring the extra $35 for a sunburst Fender Jaguar -fanciest guitar on the lot. I played the Jaguar for at least a year but by then Dad said he was done buying guitars. I did get him to spend $600 on a Vox Royal Guardsman amp before he gave up though. Dad died in 2011 at the age of 95. He still didn’t like rock and roll but grudgingly accepted The Beatles into the living room somewhere along the way. He actually bought a full set of Beatles CDs when they first came out. I think he was a closet Beatles fan all along (except for the long hair but that’s a long story for another Fathers Day). So thanks Dad for helping me find a lifelong passion. It’s still working for me 55 years later. Not every Dad does that for his children and I appreciate having had a Dad that did. 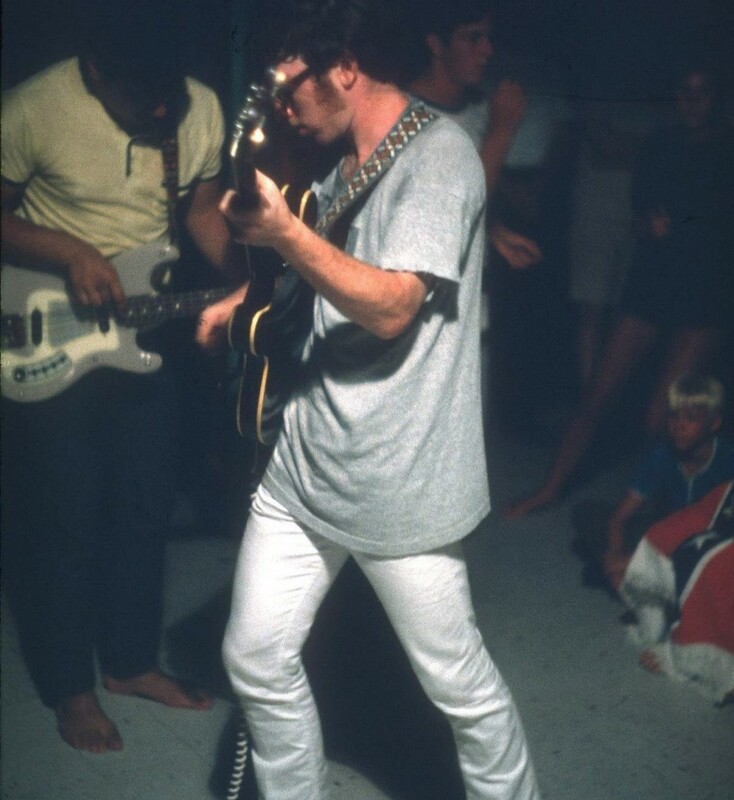 That’s me playing a Gibson ES-330 in 1967 or so at a gig at the Ridgewood Swim Club in Glenville, NY. The Jaguar was gone by then. I owned the DuoSonic until 2004 though. A dealer with a big inventory should still go through every guitar from the pot codes to the tuner tips to make sure it is as described and there are no hidden or undisclosed issues. 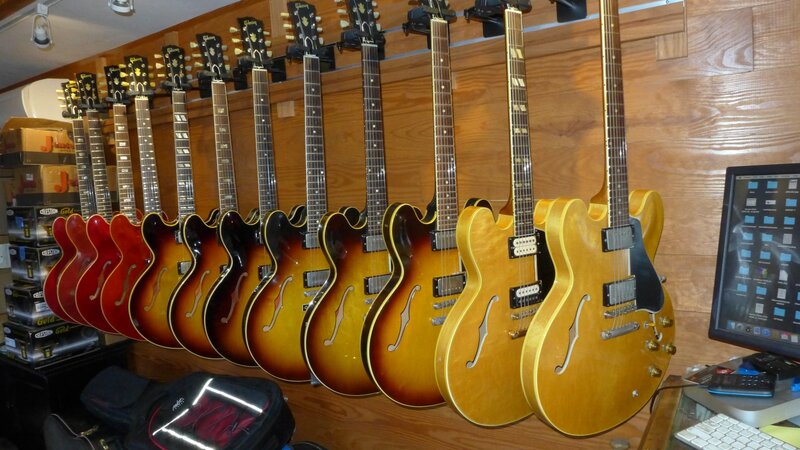 An individual seller with one guitar to sell should do the same or consult a vintage dealer to help out. Most will be happy to. This is the famous “A” rack at OK Guitars. I’ve been keeping close track of the accuracy of the descriptions of guitars I buy for at least 8 years now. When buying from an individual seller (usually without a return policy), I ask for a lot of specific photos but when you’re buying from the 90 year old widow of the original owner, you can’t really ask her to pull the pickups and photograph the PAF stickers. Sometimes, you can’t even get a single photo. You simply take your chances. But even when I get all the photos I need, there can still be issues that don’t show up in photos. Overspray for one, rewound pickups for another. Fortunately, the issues are mostly minor but sometimes an undisclosed or unknown big issue like a well repaired headstock crack can sneak by. After all, Grandpa (may he rest in peace) didn’t usually tell Grandma that he broke his $400 (in 1959 dollars) guitar and had to spend $50 to get it fixed. She would just get upset. So, a dealer has to walk a very fine line when buying a guitar from someone who knows nothing about guitars. You might ask what percentage of guitars that I get are not accurately described? 20%? 25%? 30%? Nope. 90%. Seriously, nearly every guitar I buy from an individual seller has a hidden or undisclosed issue. 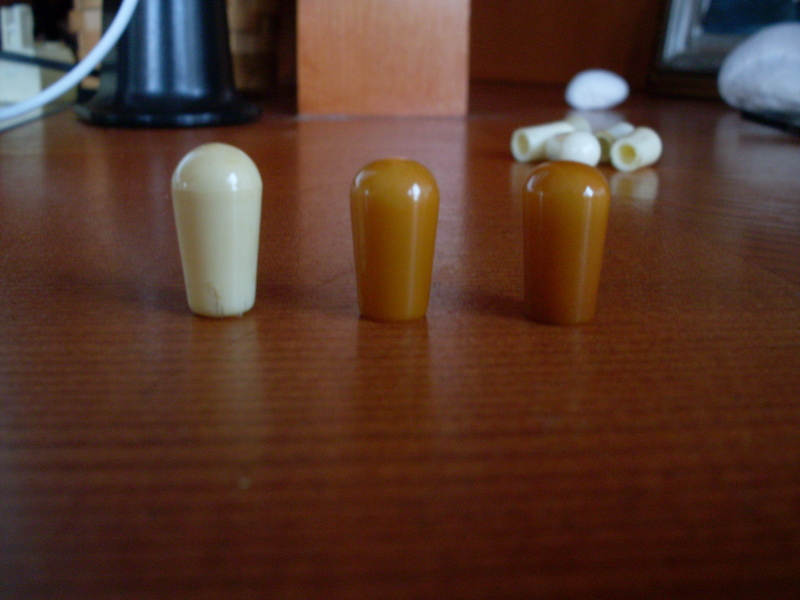 It’s usually something pretty benign like a changed switch tip or pot that I can address from my parts stash. But, as I mentioned, sometimes it’s rewound pickups, undisclosed damage (usually a minor crack or delamination), repro parts, touchups and on and on. I have horror stories. And here’s the upsetting part-when I buy from dealers, the percentage isn’t all that much better. Since the rise of Reverb.com, everybody seems to be a dealer which is OK but it can be hard to differentiate between really knowledgeable dealers who offer up a healthy dose of expertise with their guitars (and a liberal return policy) from those who don’t. That said, many “hobby” dealers are as knowledgeable (or more so) than established dealers and, with their smaller inventories, can be more careful with inspecting and describing their inventory. After all, I was a hobby dealer for 10 years before I became a full time dealer with a brick and mortar shop. I still go through every guitar with the same attention to detail as I did in 1998 when I was cruising Ebay for bargains. So, what’s the bottom line here? It is this: Expect issues. Build it into your offer. Inspect every guitar you buy and every guitar you sell as if it were your forever guitar. Fix what’s wrong or disclose it before you list it for sale. It might cost you a sale or two but it will save you from returns, a bad reputation and angry customers. If you aren’t sure what you have or what’s correct and what isn’t, consult a vintage dealer. Most are very generous with their advice. Or take it to a guitar show-everybody at a guitar show seems to be ready willing and able to tell you everything that’s wrong with your guitar-even if there’s nothing wrong with it. And if you buy a guitar and it isn’t as described, talk to the seller and explain the issue. If that gets you nowhere and there’s no return policy, talk to the folks who run the venue where you bought it. Ebay is good at this as is Reverb.com. I’ve had success with both when I’ve run into intransigent sellers who insist that the guitar was perfect when it was shipped and that the frets must have gotten worn or it somehow got oversprayed in transit or in the 24 hours I had the guitar in my possession. Can you tell that this guitar was refinished from the photo? I sure can’t. Can you tell the guard is a repro (I can)? Photos help but they don’t always tell the whole story. Check your purchase out in person if you can. Get a guitar from someone who will accept returns (for any reason) if you can’t see it in person.